Badass Movies: Is Conan The Barbarian in 3D Badass? Is Conan The Barbarian in 3D Badass? I was fortunate enough to catch a screening of Conan The Barbarian in 3D tonight, and I loved it. I want to make one thing perfectly clear: Conan is a bad movie. In fact, the only movie that's comparable is Jonah Hex. That's the kind of bad on display here. However, Conan is an absolutely brilliant action movie. When dozens of armed dudes are getting cut down in unique ways every five to seven minutes, I can forgive a lack of structure, character development, and other such things that Oscar voters look for. There has been some grumbling that Jason Momoa's Conan has little in common with Schwarzenegger's Conan. This is true. Arnold's version was an educated warrior. Momoa is just a barbarian. This difference is actually very striking in the contexts of both movies. 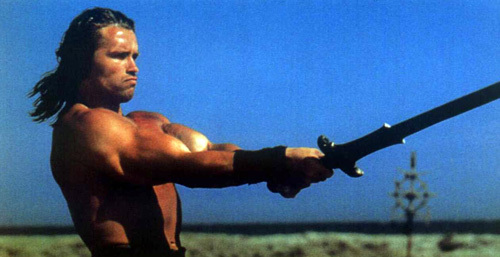 In the original, Schwarzenegger comes across as a big, regal guy who can handle a sword. In this new one, Momoa comes across as the deadliest mother to ever walk the earth. This may seem like a little thing, but it is an important distinction because of the dozens of armed dudes getting cut down in unique ways every five to seven minutes. And really, that's all anyone should want from a Conan movie: non-stop action. One quick note about the 3D. Is it necessary to see the 3D version? Nope. I didn't really see a need for it. Did it enhance the film? Yes, it was kind of cool and it wasn't distracting. But, did it add anything to the overall product? Not really. Is Conan worth seeing? Yes. It is entertaining, full of non-stop action, and it is incredibly Badass.